This round rock could be the oldest stone sphere made by human hands, says Bosnian archaeologist Semir Osmanagic. 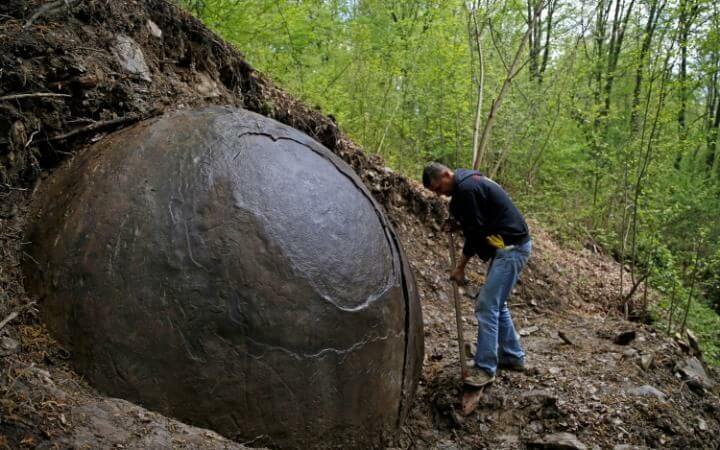 Discovered in a forest near the Bosnian town Zavidovici, the ball has a radius of between four and five feet, and an “extremely high” iron content. Dr Osmanagic believes the sphere proves the existence of an advanced lost civilisation dating back more than 1,500 years ago. According to his fellow researcher Dr. Sam Osmanagich, the region used to have many more of the spheres well into the 20th century. Many were apparently destroyed in the 1970s due to rumours there was gold hidden in the middle of them. Dr Osmanagic, known as “the Bosnian Indiana Jones,” hit headlines in 2005 when he claimed that a cluster of hills in Bosnia’s Visoko Valley was in fact the site of ancient pyramids linked by a network of underground tunnels. In 2016, critics are once again lining up to poke holes in Dr Osmanagic’s rather grand claims. Discussing the Zavidovici spehere, Mandy Edwards of the University of Manchester’s School of Earth, Atmospheric and Environmental Sciences told MailOnline the rock may not be man-made at all, and have been formed by the “precipitation of natural mineral cement within the spaces between sediment grains” – a process known as concretion.